Home / Mixed Bag / First Blog Award ! 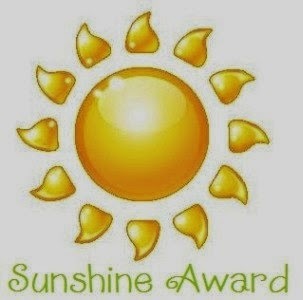 62 days have passed by, since I wrote my My First post, and today I get my first Nomination for an blog award with totally suitable name 'SUNSHINE' award. Nibha has been kind enough to nominate a total stranger like me. Wait, are we really strangers?? Don't you feel like you know me, I know you. I do, Don't you??? So Nibha(Nibhz) says "I write to Express! Feelings are best described through art, the art that I choose is the art of words!" and aptly her blog name is EXPRESSIONS! Life is all about expressions!. * Show your gratitude and link back the person who nominated you. * Nominate Up to ten of your favorite deserving bloggers who positively and creatively inspire others in the blogosphere. *Link the nominees in your post, and let them know. * Write TEN interesting things about yourself. 1. I Am in LOVE with myself. 2. I am a keen observer, and absorb qualities I admire from other people, especially whom I meet on a daily basis. 3. I am constantly exploring myself. 5. I am a Life Long Learner. 6. I am a rebel. 7. I am a confused soul. 8. I am opinionated, head strong, in contradiction I take advices and am vulnerable. 9. I am scared of Death. TEN. I don't wanna die, I enjoy the battle too much to think about the end. Oops, Count them. Yeahh I have missed a point, Yes right the fourth one is missing, why don't you fill up that one, for me in the comment below. 4. You tell amazing stories and share so much love. The 4th one for you .... " You write straight from your heart pouring out your emotions in beautiful words "
And thank you so much dear Ananya for nominating me for the award. I humbly and gratefully accept :) But I hope you will forgive me if I write about this award and all that is to be done after this A-Z challenge. I am feeling a little overwhelmed right now (more than a little, actually :) Thanks once again, Ananya! Really appreciate this. Thank you for the nomination Ananya. And congratulations to you too :) And for your 4th point, " I love telling stories, hence the name of the blog ;) "
Thats Sweet ! Thanks ! Thank you so much, Ananya, really appreciate the nomination, thank you :) Also loved knowing more about you, many congratulations to you, and here's wishing you many many more! Thank you so much Arti ! That you have an honest heart :) I can see that your posts. Congrats on the award, Ananya :) Well deserved , this one ! Oppss! I Am Sorry, But I was not the wrong page, I have nominated you for another Award, for which I will be writing a post later cos everyone is busy right now with the challenge, Sorry for the confusion ! How very sweet of you! Thank you so much!! Congrats, Ananya. It's nice to be appreciated, isn't it?